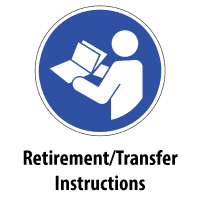 Put an “X” in the box marked RETIREMENT FORM and complete the RETIRED FROM SECTION of the form. Also, complete the ASSET SECTION of the form and indicate the Asset Inventory Number, Kind of Tag Code, the Asset Description, one of the seven codes shown above, giving the reason for the retirement, and the U of U Police Department Case Number, if the asset was stolen. Obtain the appropriate approval signatures, and send the original copy to PROPERTY ACCOUNTING. Keep a photocopy in the department. Put an “X” in the box marked TRANSFER FORM and complete both the TRANSFERRED FROM SECTION and the TRANSFERRED TO SECTION of the form. Complete the ASSET SECTION of the form and indicate the Asset Inventory Number, Kind of Tag Code, the Asset Description, the New Location of the Asset, and one of the four codes shown above, giving the reason for the transfer. Obtain the appropriate approval signatures for both TRANSFERRED FROM and TRANSFERRED TO departments. NOTE: Use the New Location Code only when making a transfer to another University Department, other than University Surplus and Salvage. To find the Location Code, Log in to CIS, click on Location Codes located under Resources & Information in the Financial & Business Services Paglet. If you have questions regarding valid locations, please call Property Accounting at Ext. 1-3973. If the form is being used to sell or transfer an asset to another University department (other than University Surplus and Salvage), code INTRA, send the original copy to PROPERTY ACCOUNTING, give a copy to the TRANSFERRED TO department and keep a copy in the TRANSFERRED FROM department. If the form is being used to transfer an asset to University Surplus and Salvage (codes CANNI, SCRAP, SURSV), complete all of the information on the TRANSFERRED FROM SECTION and ASSET SECTION and complete a Surplus Work Order Request to request a pick up by the University Surplus and Salvage Department. Have University Surplus and Salvage sign and complete any unfinished parts of the form when they pick up the asset. Give the original copy to University Surplus and Salvage and keep a copy of the signed form in the department. If transferring computer equipment to University Surplus and Salvage please complete the COMPUTER SECTION regarding hard-drive sanitation. If you have any questions, please call Property Accounting at 581-8673 or 581-3973.